Congenital diaphragmatic hernia have two forms, one of them is morgagni hernia and the other one is bochdalek hernia. It is an abnormality of diaphragm by birth. In this condition, a hole or opening is present at the posterior side of the diaphragm. 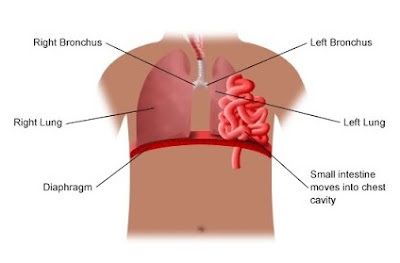 This opening allow the organs of abdomen involved in GIT like stomach and intestine, to protrude through this opening in to the thoracic cavity. This defect occur due to inappropriate attachment of diaphragm at the posterior side and the reason behind this is the pleuroperitoneal membrane fails to close in utero. Lungs are also compressed and can be life threatening. Bochdalek hernia is a congenital disease so it occurs during the development and growth of fetus inside the mother’s womb. The development of diaphragm occur in the seventh and 10th week of pregnancy. And along with diaphragm stomach, intestine and esophagus are also formed. Bochdalek hernia may occur due to malformation. Due to malformation during development of fetus, the contents of abdomen i.e. stomach, intestine and esophagus can get locked during diaphragm development. Along with genetic factors, environmental factors can also be the reason behind the diaphragmatic defect named bochdalek hernia. In bochdalek hernia, the symptoms appear along with the birth of baby. Baby feel difficulty in breathing or the respiration may become fast. Heart beat may also become fast along with fast respiration. Baby may be born with a condition named cyanosis in which the skin turns blue tinted. Physical appearance of the chest of baby should also see at the time of birth. Chest appear to be larger of one side and also the abdomen appear in concave shape. All these symptoms discussed above shows the presence of bochdalek hernia. Bochdalek hernia is a life threatening condition. The infant born with respiratory problem and breathing difficulty. So the mortality rate is high in bochdalek hernia. When the abdominal organs i.e. stomach, intestine and esophagus invade through the diaphragm during development process of fetus the lungs get compress and may lead to death due to insufficient respiration. About 85% of cases are life threatening due to respiratory distress. The invasion of abdominal organs may also puncture the lungs and the baby can’t breathe properly and causes problems to the respiration of mother. The invading organ is also affected. Number of factors are considered while selecting treatment therapy. And it also depend upon the time of diagnosis either within womb or after birth. The severity of disease also matters. In treatment therapy, the infant is 1st admitted to the NICU i.e. intensive care unit. The ventilator is attached with the body to make the respiration easy. In other cases, a bypass respiration machine is attached to the infant for breathing. And it is temporary. This bypass machine is also known as ECMO. Last but not the least treatment recommended is surgery. Surgery is performed to arrange the organs on their original positions.